Flint Rock Farm has been in the family since 1791 and Laura and Mike Younts moved their family to Cameron in 1985. When Laura retired from Cameron Elementary as a kindergarten and first grade teacher, she envisioned sharing their “farm experience” with students and families while preserving their agricultural heritage. As an advocate for the farmer, Laura is learning how to make use of the land she has inherited. In addition to school field trips, birthday parties and family reunions, individual family outings are offered in a pastoral setting on historic Plank Road. Educational learning experiences include visiting with the goats, donkeys, chickens and horses to learn their habits and needs and help Laura feed them if close to their meal time. 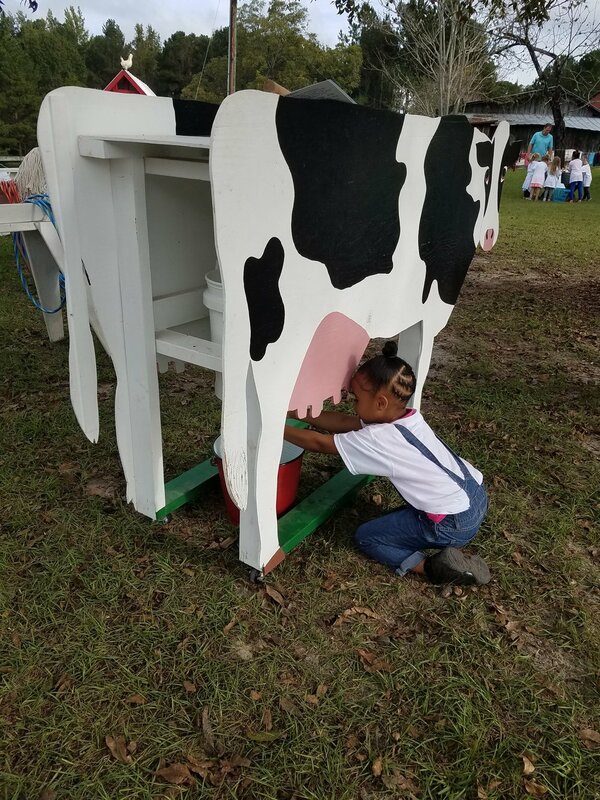 Favorite hands on activities are in the barnyard where guests experience the way it was on Laura’s Grandparents’ farm with a hand water pump, milk the cow simulation, a corn sheller, wash clothes in a tub with scrub board and hang out to dry, push lawn mower and a walking plow. Yes, Grandma’s outhouse still stands but the farm does have indoor bathrooms to use! It will make your child appreciate the modern conveniences we take for granted while enjoying the fresh air of the country. Visit Flint Rock Farm by advance appointment based on availability and enjoy the above described activities which are best suited for families with children three years old through fourth grade for an hour. Dress for the outdoors and be aware of seasonal allergens and insects. Guests are welcome to enjoy a picnic they bring under the shelter after their experience. S. Plank Road and travel one mile. Our dirt driveway is on the left across from a John Deere mailbox by the pond on the right.